Announcing The Forensic Aspects of Ancient Egypt at the University of London, 20th February 2010: 11am - 5pm. Please note new date. The 21st century has seen incredible advances in our knowledge and use of forensic sciences, to investigate crimes and to find out about people from ancient times. 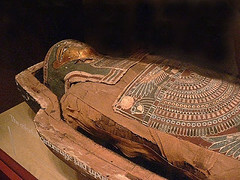 How can we apply this information the the people of ancient Egypt? Join us on this fascinating study day to learn about: identifying the age at death of a mummy or skeleton; if the body is male or female (sexing); what diseases people had; facial reconstruction; Other scientific techniques; and test your skills in a hands-on practical session. Fee includes afternoon refreshments. Please note: as places are limited bookings must be received no later than 4 February 2010. Cheques payable to Joyce Filer, please send SAE. Send bookings to Joyce Filer at Accountability, 4 Lowndes Court, London, W1F 7HE.